Billy the pony and Daisy the duck turned a few heads when they came to visit their owner Julie Walton in hospice. 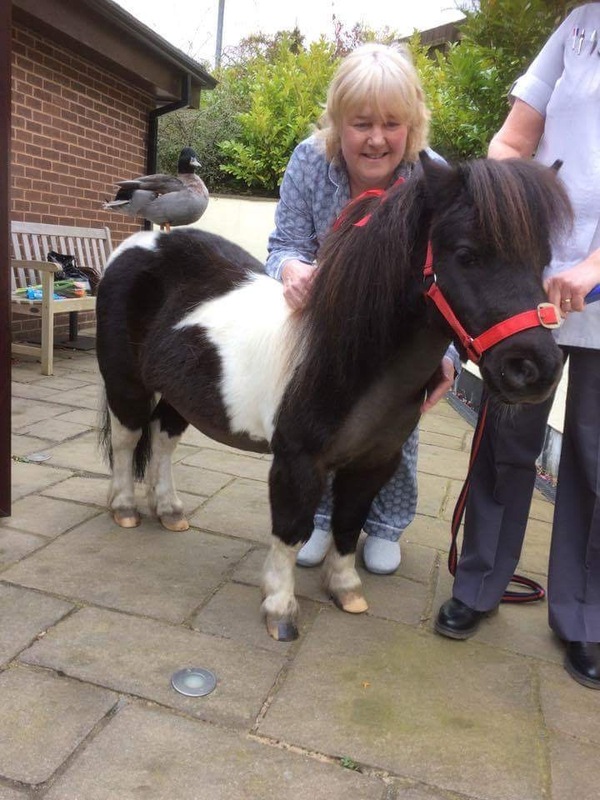 He may only be 30” high, but Billy the Shetland pony lifted the spirits of Julie while she was receiving care at the hospice. He was joined by his feathered friend Daisy – Julie’s pet duck. The visit was arranged by Julie’s friends Phillipa and Val, who are currently caring for Billy. Julie, who has now returned home after her nine-day respite at the hospice to treat the symptoms of her bowel cancer, has enjoyed three visits from Daisy – who is actually a boy – and one visit from Billy. Julie, from Darwen, said: “I knew I was having a visitor but I didn’t expect a duck and a Shetland pony to walk down the corridor. Julie, who has six ducks, three geese, eight chickens, a parrot, a horse and a pony, said: “I was just sat in my room when one of the nurses came and opened the doors to my room and in walked Billy and Daisy. It was a total surprise. “Everyone from the hospice was crowding around them. The staff thought it was fantastic. To have my pony walk in just brightened my day. Julie has had Billy for three years, and Daisy for eight years and said they were ‘very well behaved’ during the visit. Many of our patients enjoy visits from four-legged friends and other unusual guests. Sharon Crymble, Fundraising Manager, said: “East Lancashire Hospice believes in trying to make every day the best day possible for patients and their families. We want them to feel at home – and if that means them bringing in their pets then that’s what they can do.